*Note: this is considered an adult title because of a few scenes and because it's a bit darker than most YA. It definitely has cross-over appeal, but I thought that I should at least have a disclaimer first. I first heard about this book from Maggie Stiefvater. If I'm not mistaken, she'd posted about it on her tumblr, and then I'd added it to my GR to-read shelf. Then, sometime later, I'm told there's a giveaway for this book, and I get curious. I see all the blurbs for the book. I see that Maggie has recommended the book to Diana Wynne Jones fans, of which I definitely am. I see that Rachel Hartman loved this book, and I quite like Seraphina. And so I had a feeling that I was going to really enjoy this book. So I did. I disagree with the Diana Wynne Jones recommendation. I think that perhaps the plot structure and the themes (Agnieszka says that she won't get chosen; it's her friend's fate to get chosen, she's not up to par... Sophie in Howl's Moving Castle says that the eldest of three children is the unlucky one; she's not up to par... etc.) might be similar, but Uprooted, as a whole, is much darker (and for "older" audiences, I guess, if you really and truly follow those labels) than what I've read from DWJ. I would recommend this to fans of Rosamund Hodge, which I will explain in a little bit, and also to fans of Seraphina - not just because Rachel Hartman liked and recommended this book, but because I actually had a similar experience reading this novel and Seraphina. I think that both have very similar lenses for how the plot/character development/tone is approached. This book is supremely well executed and well written. I'm not sure that I really have any complaints for how anything was handled here. My only complaint would be to poke at myself and wish that I could get more involved in high fantasy worlds (I tend to be more of a character oriented than plot/world oriented reader, so sometimes I will skip over descriptions of the HF world because I don't care about furniture or clothing, etc. that much, though I do appreciate that the author considered these elements). ANYWHO. The world-building is absolutely phenomenal. If you like fairy tales, darker Grimm retellings, you'll definitely love this book. If you love high fantasies with clearly defined magic systems, you'll love this. So, there's a cinematically creepy Wood. It's sentient and gorgeous but also brimming with dangerous, nightmare-inspiring creatures (imagining this on screen was terrifying). Not only do you get to find out more about said creatures and the dangers of the Wood, but you also get to uncover its history and see how each individual character has been affected by the presence of the Wood in his/her life - whether the character is the King and far away from its dangers, or like Agnieszka, rather close and well aware of the seed of corruption it can plant in people's minds. And the magic system is very well defined: we learn more about previous magic users (the wonderful history of this world!) as well as simple spells and how not everything is known about magic as it stands today (gasp, exceptions/rule-breakers do exist!). There's a magical hierarchy, books, etc. Each wizard clearly has their own specialty and their own way of using magic. It's all a delight to read and explore; and you ALWAYS get a sense of how this world has affected each and every character - their outlook, their attitudes, their goals, wants, needs, etc. Because the world is so well developed, with a pretty well developed history (enough so that you can imagine a companion novel elsewhere), the plot twists in really unexpected ways, and I never knew quite what to expect for what would come next or how the terrors the Wood posed would be solved. Plus, it then became really easy to picture what was going on (read above: imagining some of the scenes was terrifying; THE WOOD IS TERRIFYING). The heroine, Agnieszka, gets to grow so much in this novel. Just reading the synopsis, you already know how little she seems to think of herself. Her best friend, Kasia, is beautiful, the Chosen One for the Dragon, of course. Not. So, Agnieszka has to learn to change her expectations for her future. She's heard so many things about the Dragon and what living with him would be like -- and of course so few of those rumors were right too. The Tower is so hard to navigate, and magic so draining. But if there's a will, there's a way; and the circumstances force Agnieszka to adapt. She becomes stronger once she accepts herself and her magic, and more confident of her place in helping others. I said that this book was for fans of Rosamund Hodge. This is because of the fairy tale feel + mysterious castle/Tower layout + the heroine's self-growth. In Cruel Beauty, Nyx is also forced to reevaluate the Gentle Lord and what she has heard of him, just as Agnieszka must learn to trust the cold Dragon in order to find out more about what he is hiding, how she can improve her magic, and what she can do for her village and country. However, the romance is much more of a side plot in Uprooted than it was in Cruel Beauty, and much more of a side plot than I expected (with the synopsis focusing on how the Dragon would choose Agnieszka, I thought that their relationship would be at the forefront... it's important and helps in a lot of character realizations/plot twists, but it definitely falls back when Novik needs to move the plot along in other directions). Still, the romance has its moments -- huzzah for Agnieszka taking charge and being so confident by the end! The main female friendship between Agnieszka and Kasia also reminded me of the sisterly bond in Cruel Beauty, dark but unbreakable. Naomi Novik is not afraid to point out the less kind thoughts we may have about one another, even friends; but how exposing those thoughts and moving past them would allow for deeper rooted friendships and relationships. So, what do we have here? 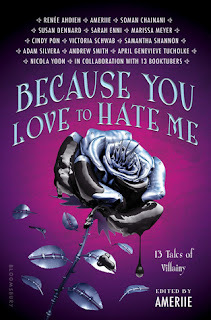 A side plot of slow burning hate-to-love romance (the Dragon is a bit of a jerk, and cold, towards Agnieszka), extensive character development for a determined, spirited heroine who learns to wield magic with skill, plenty of plot twists and an absolutely wonderful main female friendship. Plus, of course, a creative fairy tale world, with a cinematically creepy evil Wood. 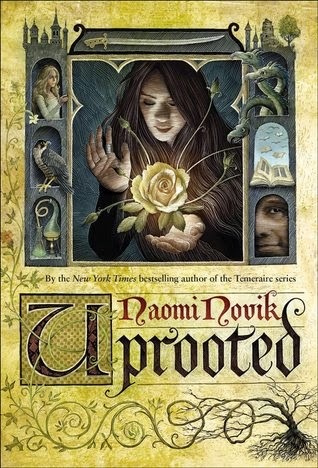 Are you reading Uprooted? I would certainly hope so. You'll be in the hands of a master storyteller. I love Naomi Novak's Temeraire books and I must say I really like the sound of this book, your review has really helped me decide that I definitely MUST read this book so thanks for the wonderful review! This sounds fabulous. I have yet to read anything by this author, but have just added Uprooted to my TBR pile. Great review!